I thought that the anti-inflammatory diet and lifestyle I outlined on this blog would be a general purpose starting point for the treatment of all diseases. Inflammation is the foundation for allergies, autoimmune diseases and cancer. Inflammation is a basic defense against infectious diseases and many tissues require signaling components integral to inflammation for their normal function, so it is possible to overdo anti-inflammatory treatment and produce immuno-suppression. But that is unusual. What I am talking about here is inflammation caused by vitamin D, omega-3 oils, potentially low carbs and inhibitors of NFkB, such as tumeric. This is Paradoxical Inflammation. The obvious example of a paradoxical inflammatory disease is rosacea. Rosacea seems to be a large group of diseases that manifest in facial inflammation. Excessive flushing of the face can become persistent and form pustules and swelling. The triggers for rosacean inflammation are legion and idiosyncratic. They include mundane social interactions, numerous foods, temperature extremes and, paradoxically, just about everything that I recommend to decrease chronic inflammation. Why do otherwise anti-inflammatory foods and exercise make rosaceans red in the face? Even vagal stimulation that is uniformly calming to inflammation, can make a rosacean flush. This is very inconvenient. I can only invoke the typical players: cryptic bacteria, biofilms, vagus nerve stimulation and response, lymphocytes/macrophages, cytokines and neurotransmitters. All rosaceans have demonstrated facial inflammation and have had long term exposure to antibiotics and NSAIDs. That combination suggests that bacteria have been transported from a leaky gut (NSAIDs) to the site of inflammation (the face). It is likely that cryptic bacteria inhabit the dermis near the blood vessels and resident lymphocytes/mast cells. This is also the location for axons from vagus nerves. 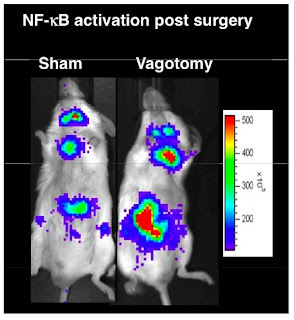 Thus, vagus stimulation may result in the release of neurotransmitter acetylcholine to stimulate lymphocytes/mast cells with subsequent release of cytokines. In this case the cytokines are inflammatory. Other sources of inflammatory cytokines are lymphocytes/mast cells activated by endotoxin release from cryptic bacteria triggered by immunological attack. In this case, the immunological attack can be initiated by disruption of the stasis invoked by the cryptic bacteria. It is hypothesized that the cryptic bacteria remain in tissue, because they are able to induce a hibernation-like physiology in the tissue. Disruption of the hibernation would initiate an immunological assault. Disrupting agents typically include vagal stimulators, such as activators of the hot or cold sensors, e.g. capsaicin, castor oil or menthol. Interestingly, the cryptic bacteria require a residual level of inflammation to acquire nutrients from the host. Anti-inflammatories that inhibit NFkB may destabilize the bacterial/host interaction and result in an immunological attack on the bacteria. All of the attacks on the cryptic bacteria release inflammatory endotoxin. During the course of the disease and following numerous antibacterial treatments, bacteria can be continually recruited from safe havens, such as gut biofilms. Antibiotic treatment of biofilms converts the biofilm community to antibiotic resistance through activated horizontal gene transfer. Moreover, harsh treatment of biofilm communities initiates shedding of bacteria that could migrate across the leaky gut adjacent to the gut biofilms and provide new emigrants into the inflamed face tissue. A likely resident would be Chlamydia pneumonia, which has been demonstrated to be carried by macrophages and offloaded at distant sites of inflammation. This brings up the question of why vagal stimulation shifts from anti-inflammatory to inflammatory in rosaceans. I don’t think that the vagus nerves change in either their activation or in the neurotransmitters that are released as a result of stimulation. This means that the cells that respond to the vagal acetylcholine must be changed. I think that the change is a depletion of Treg cells and the result is that acetylcholine receptors on the remaining T cells cause a release of inflammatory cytokines. These cytokines cause the release of NO by endothelial cells and vasodilation. Leaking of endotoxin from the resident cryptic bacteria causes persistent dilation and restructuring of the vasculature. 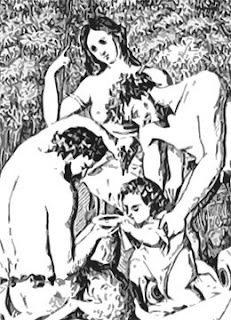 Since I have been forced to explain paradoxical inflammatory diseases, I might as well speculate on exotic approaches that already suggest potential treatments. Ingesting parasitic worm eggs (helminth therapy) has proven successful in the treatment of inflammatory diseases such as asthma, allergies and IBDs. Interleukin 2 (Il-2), usually used as a complex with an anti-Il2 antibody, is also a productive treatment. 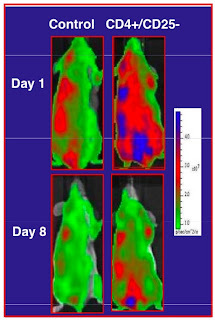 In both of these cases, the treatment stimulates the proliferation of Treg cells, which appear to be deficient in many of the inflammatory diseases. These treatments should also lead to a lowering of inflammation in the gut and suppression of inflammation as a result of vagal stimulation. Inhibitors of acetylcholine receptors, e.g. scopolamine patches, might also be interesting to test to see if they inhibit rosacean flushes in response to typical vagal stimulants such as castor oil or menthol. Addendum: Another possibility associated with the heavy use of antibiotics by rosaceans is intestinal (biofilm?) candidiasis. Yeast infections are common after prolonged antibiotic treatment. Interestingly, Candida produces resolvins from omega-3 fatty acids and the resolvins suppress neutrophil activity that would attack the yeast. Thus, many of the anti-inflammatory treatments would actually aggravate yeast infections and contribute to rosacea. Treatment for candidiasis (keeping in mind that yeast may be protected by biofilms) helps many rosaceans. Stripping biofilms may be useful if pro- and pre-biotics are used to displace Candida. One of the major reasons why healthcare practitioners are unable to cure diseases, is that their molecular view of disease is outdated. Their models of key signaling interactions lack critical molecules and fundamental types of chemical bonds are ignored. The most pervasive and perhaps the best text book on cell biology, The Molecular Biology of the Cell, first authored by James Watson, lacks a discussion of the bonding of aromatic amino acids (tryptophan, tyrosine, phenylalanine) with basic amino acids (arginine, lysine), carbohydrates, and aromatic phytochemicals, e.g. plant antioxidant or alkaloids. As a result, medical school graduates lack familiarity with the prominent interactions that dominate disease and drug treatments. The dominating significance of aromatic hydrophobic bonds is the strength of these bonds, ca. 20 kcal/mol versus, the commonly considered weak bonds (hydrogen, ionic) at 1-2 kcal/mol, the same as the kinetic energy of water at body temperature. Thus, structures, such as alpha helices and beta sheets of proteins, require multiple weak bonds to be stable, but the hydrophobic bonding of tryptophan to a single arginine draped across its surface is stable. Tryptophan is the most highly conserved amino acid in protein structures (more than cysteine forming disulfide bonds!). This means that tryptophan is the most important amino acid in protein structure, and probably determines how proteins fold. Carbohydrates have hydrophobic faces to their ring structures and typically bind to lectins, glycosidases and glycanases, via the hydrophobic surfaces of tryptophans or tyrosines in active sites. Transport of proteins into nuclei is by binding of arginine or lysine residues of nuclear localization signals (basic quartets or neighboring basic pairs) to tryptophan hydrphobic residues projecting from the surface of LRR (leucine-rich repeat) importin molecules. Heparin binds to basic amino acids in proteins via hydrophobic interactions. Aromatic dyes, such as berberine, bind to heparin through similar hydrophobic interactions. 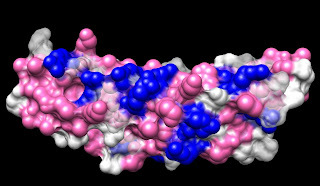 Heparin binds to the basic amino acids arrayed in stacks of amyloid molecules and berberine blocks these interactions. Congo Red, a diagnostic dye for amyloids, is an aromatic molecule. Similar interactions occur with prions and the plaques of atherosclerosis. Acidic polysaccharides form the matrix of biofilms. Heparin and nucleic acids can also serve this function. PEG, which disrupts hydrophobic interactions, can be used to disrupt binding of proteins to heparin, nucleic acids and biofilm polysaccharides. Heparin binding mediates the interaction between most growth factors or cytokines and their cell surface receptors. Many viruses and bacteria bind to cell surfaces via heparan sulfate. Antimicrobial peptides, e.g. defensins, have groups of basic amino acids. 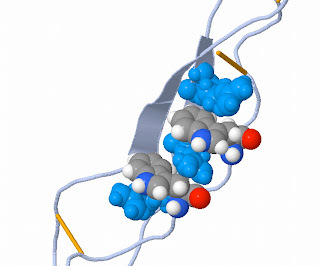 Heparin binding domains excised from proteins as peptides are antimicrobial. Stomach proteases cleave around heparin-binding domains to produce antimicrobial peptides. Intestinal proteases cleave within heparin-binding domains and inactivate bacterial and viral agglutinins. Life starts with heparin, i.e. heparin is leaked into fertilized eggs to remove the small, highly basic proteins used to package the sperm chromosomes. Heparin is injected experimentally into nerves to silence IP3 signaling based on the binding of the hydrophobic face of inositol to basic amino acids, similar to heparin binding domains, of the IP3 receptors located on the surface of the ER. The cytoplasmic domains of some receptor proteins have basic regions that interact with the IPs of the membrane surface, but subsequently serve to transport membrane-derived vesicles to the nucleus via importin carriers. Heparin/heparan sulfate proteoglycans are secreted bound to basic molecules such as polyamines or histamine. Heparan sulfate proteoglycans are continually secreted and taken up with a half life of six hours. This circulation is a major transport system of most cells. Amyloid/heparan aggregates on the surface of nerves and gliadin/tTG/antibody/heparan complexes on endocytes (celiac) may poison this system. All allergens and autoantigens have a triplet of basic amino acids that may be involved in the initial aberrant presentation of these antigens as a result of the internalization by the carbohydrate-binding domain of mannose receptors on the surface of inflammation-stimulated immune cells. Many neurotransmitters bind to their receptors via hydrophobic, aromatic interactions. These same receptors interact with hydrophobic, aromatic phytochemicals, e.g. “anti-oxidants.” Many spices, herbs, alkaloids and other phytochemicals have their abundantly complex interactions via these mechanisms. 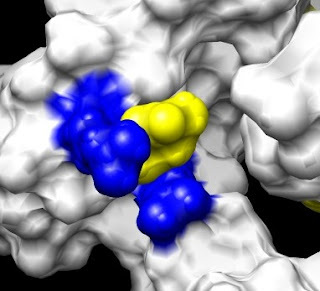 Crystals of the tryptophan repressor involved in binding tryptophan and altering the expression of genes involved in tryptophan synthesis, shatter in the presence of tryptophan -- the tryptophan (yellow) strongly binds to basic amino acids (blue) in the tryptophan-binding domain of each repressor protein in the crystal and alters its shape.